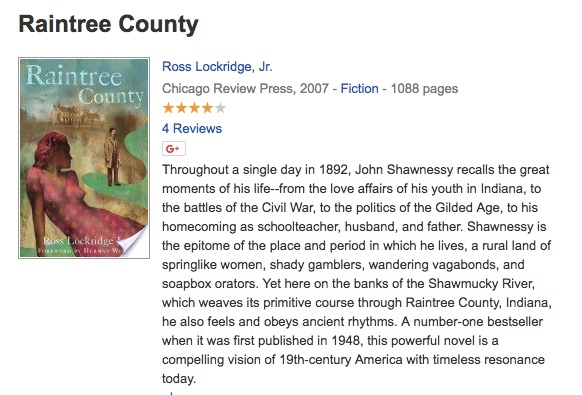 "Throughout a single day in 1892, John Shawnessy recalls the great moments of his life..."
It ends by letting the reader know that this was a bestseller when published in 1948, and calls it a "powerful novel." The blurb on a 1909 version of Darwin's The Origin of Species is mysterious because the book isn't a recent publication with an online site providing the text. 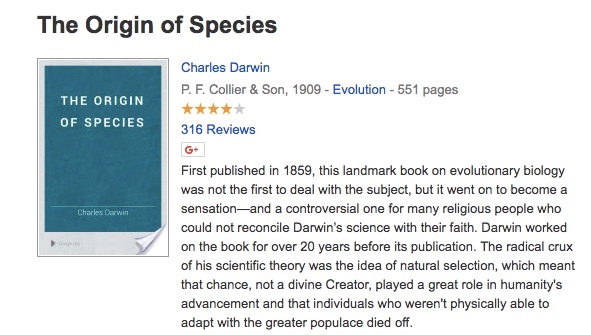 I do not know where this description comes from, but because the entire thrust of this blurb is about the controversy of evolution versus the Bible (even though Darwin did not press this point himself) I'm guessing that the blurb post-dates this particular publication. 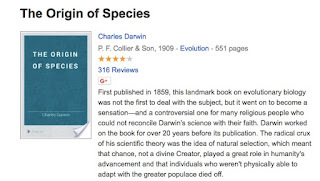 "First published in 1859, this landmark book on evolutionary biology was not the first to deal with the subject, but it went on to become a sensation -- and a controversial one for many religious people who could not reconcile Darwin's science with their faith." That's a reasonable view to take of Darwin's "landmark" book but it isn't what I would consider to be faithful to the full import of this tome. The blurb on Hitler's Mein Kampf is particularly troubling. If you look at different versions of the book you get both pro- and anti- Nazi sentiments, neither of which really belong on a site that claims to be a catalog of books. Also note that because each book entry has only one blurb, the tone changes considerably depending on which publication you happen to pick from the list. "Settling Accounts became Mein Kampf, an unparalleled example of muddled economics and history, appalling bigotry, and an intense self-glorification of Adolf Hitler as the true founder and builder of the National Socialist movement. 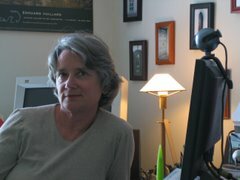 It was written in hate and it contained a blueprint for violent bloodshed." "This book has set a path toward a much higher understanding of the self and of our magnificent destiny as living beings part of this Race on our planet. It shows us that we must not look at nature in terms of good or bad, but in an unfiltered manner. It describes what we must do if we want to survive as a people and as a Race." I don't know how these folks now feel about having their texts intermingled with publications they would never buy and described by texts that may come from shady and unreliable sources. Even leaving aside the grossest aspects of the blurbs and Google's hypocrisy about its commercialization of its books project, adding blurbs to the book entries with no attribution and clearly not vetting the sources is extremely irresponsible. It's also very Google to create sloppy algorithms that illustrate their basic ignorance of the content their are working with -- in this case, the world's books.